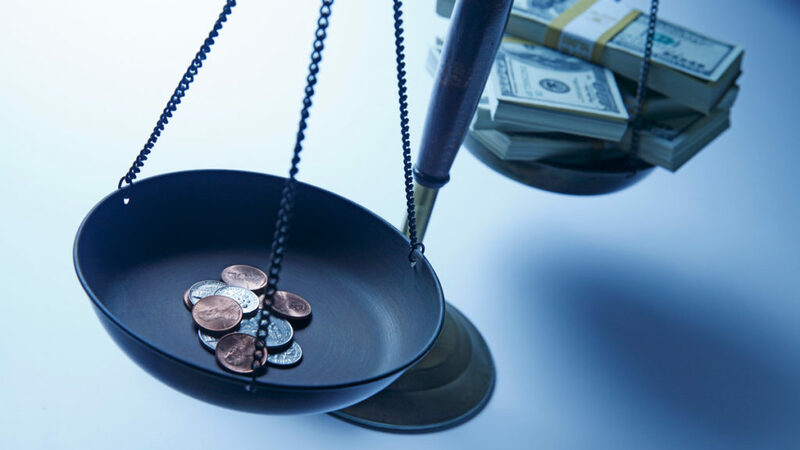 Why is income inequality, a pervasive feature of human history since there have been humans to have history, a persistent matter of public concern? And if income inequality is an important public concern, why does it persist? Sometimes tough questions have surprisingly easy answers. In its mildest forms, excessive income inequality makes people unhappy, and that is no small thing when it comes to public policy or anything else. Happiness is an important part of social well-being. What makes us unhappy is the alternative: a feeling of powerlessness, of inability to succeed and to share in the life we see around us. This situation may breed envy, a sin, and can make us despair, a condition from which it is difficult for humans to recover. Taken to an extreme, income inequality and its routine companion, wealth or asset inequality, lead not just to unhappiness but to lack of faith and trust in the world around us, and what follows from that is disillusionment with the public institutions that govern us. This has been the lot of several countries in Central America in the past century or two, and so it is of several in Africa today. It does not stop with lack of trust. From 1789 at least, populist uprisings have arisen from a lack of faith in public institutions and the restraints that governments have placed on citizens’ abilities to pursue their dreams and fulfill their individual capacities. While governments may sometimes find such restraints necessary to retain power for a time, they routinely have led to revolution, with governments violently overthrown and replaced by superficially egalitarian regimes. We know there is a point where excessive inequality and individual disempowerment lead to upheaval – a line which, once crossed, may lead to human disaster. Yet there are no numbers that political scientists or economists can assign to a tipping point that defines “excessive” inequality, of the degree that triggers revolution, nor is there any assurance that revolution will bring something better. Revolutions, though sometimes necessary, do produce dystopias. There are many dystopian products of revolution around us, among which North Korea of course stands out. Equality of extreme poverty is the norm, wealth and power are reserved to the politically privileged few, and hopelessness defines the life most citizens endure. In such dystopian states, most starkly the one ruled from Pyongyang, the social harm is no longer inequality but the relentless poverty generated by the state’s relentless determination to snuff it out. In a relatively modern democracy like Canada’s, what drives inequality? Why do we see it in a society like ours, where we try to make opportunity available to everyone, and the state taxes the well-to-do and provides money and support to the less fortunate? To see why inequality arises, consider a world where everyone starts out equal. Let’s say we all finish school at age 20 and get jobs paying $25,000 a year, to pick a number that is at once modest and one that many 19-to-29-year-olds might be happy to have. Not only that: we all have the same opportunities and the same ability and willingness to seize them, and we do equally well in work and in life. “Harrison Bergeron” is a 1961 story by Kurt Vonnegut describing equal starting places and equal outcomes, even after a lifetime of work and no matter what one’s effort. Vonnegut knew what it would take to deliver complete equality. The athletic and graceful would need weights to burden them, to slow them to the pace of the graceless; the keen-eyed would be fitted with glasses that blurred their vision; and the bright would wear noise-making headphones that stopped them from thinking clearly. Vonnegut’s vision was a vision of hell, not a meritocracy but a mediocracy, one so numbing that human hope and ambition are squelched to the point of despair. To capture the idea of skill, effort and one’s start in life, or luck, I assigned income starting points and skill and effort parameters from mutually independent lognormal distributions. Skill is represented by an income growth rate sampled from a distribution with mean 2.5 per cent and sigma (more or less a standard deviation) equal to 0.5; effort is assumed to have the same impact and to be drawn from a similar but independent distribution. The starting point, meaning starting income, or luck, is drawn from another distribution with mean $25,000 and sigma equal to 0.5. I assume growth rates are fixed over time, with no cohort effects; the reported results reflect the distribution after 40 periods (years). Now, suppose instead that we start people off in life at identical levels, meaning incomes, but we let them be free. In this world, we are able to take advantage of our skills. Having “skill” can mean you’re bright, or well educated, or you know to grab an opportunity when you see it, or you remember your mother’s wise words or otherwise follow the good common sense that God gave you. Such “skill” is not evenly distributed among us – most of us are middling, many are guileless or have little or no capacity to learn from error, a few of us have plenty of skill, and fewer still are truly rich in it. In this freer world, effort counts too – hard work can look a lot like brains. Do you stay a few minutes late to finish a project, do you remember to treat every customer like gold and get promoted to shift manager in your first six months on the job? Like skill, the drive to work hard is not evenly distributed among us, but it is distributed differently from skill. That is why there are bright but lazy people who never amount to much, and slow movers who nonetheless rule business or political empires. Even so, life is not rosy. We are not all dealt the same cards. Some of us fail to finish high school, we are not all good at arithmetic, some of us had parents who sniffed gasoline and some of us had no parents at all. Most of us start life in the middle of the pack, many of us are not quite that well off in starting out, and a few of us have every opportunity available from the get-go, are brilliant and know to take advantage of it. There is an inherited component, and that too is part of the luck of the draw. These things matter, and when we have different skills and drive, income inequality arises from year one, even if every one of us starts out with the same income. As years go by, small differences mount, and the income difference between those at the top and bottom steadily rises. That happens, as I said, even if starting incomes are the same. If the starting points differ, a little more inequality arises and remains after, say, 40 years. But the starting point is not the main determinant of outcomes – skill and effort matter more over time. In life, having a good start does not mean you’re bright; having a lousy start does not mean you’re lazy; and whether you have a lousy start or a great one does not define what happens for the rest of your life. 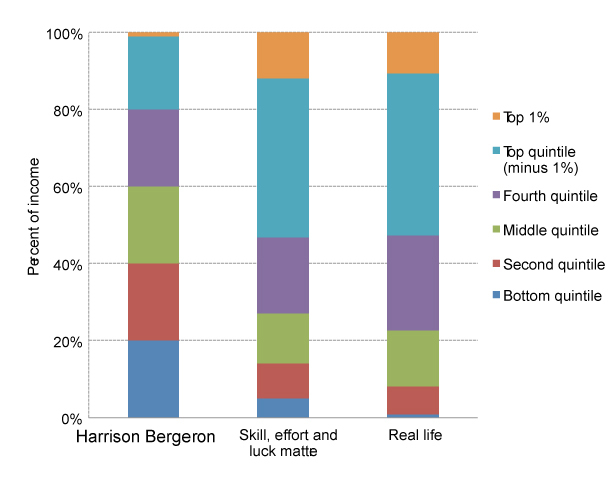 To illustrate this, I created a numeric sample of tens of thousands of individuals, and assigned them skill, effort and the start we get in life – meaning starting income, which reflects skill, effort and the luck of the draw when we enter the workforce – using representative, random distributions that look a lot like what we know about the data. How well does this statistically driven thought experiment represent real life? That is what I show in the right column, which represents a recent Statistics Canada estimate of pretax market income, distributed by quintile. The similarity between the two columns suggests the processes I describe do a decent job of painting a realistic picture. My model assigns more income to folks at the low end, relative to “real life.” There are two statistical reasons we might see very low incomes in real-life distributions. One is that the young and old have different earnings patterns from others, and I do not try to model the population’s age composition. The other is that skill, effort and having a clean start might not be independent – put another way, if your parents did not finish high school, the odds go up that you won’t either. What is remarkable, though, is not that there are differences between the middle and rightmost columns, but that they are so similar. What to do, however, if we think the inequality these processes produce is “too much” inequality? The likely policy answer seems to be to ensure opportunity. Make it hard for kids to avoid finishing high school. Do not make it too hard to take on an apprenticeship. Make it easy to move from province to province in chasing opportunity. Make sure work has its rewards. Do not punish success, or savings. Pursue open trade and knowledge exchange. Create opportunity where there was none before. We know that complete equality is at once a chimera and a vision of an impoverished hell. Complete inequality leads to suppression, revolution or most likely both. In between lies opportunity.